경북 영양군 입암면 산해리 강가의 밭 가운데에 서 있는 탑으로, 이 마을을 ‘봉감(鳳甘)’이라고 부르기도 하여 ‘봉감탑’이라 이름붙여졌었다. 석탑 주변의 논밭에 기와조각과 청자조각이 많이 흩어져 있어, 이 일대가 절터였음을 알수 있다. 탑은 벽돌 모양으로 돌을 다듬어 쌓아올린 모전석탑(模塼石塔)으로, 1단의 기단(基壇)위에 5층의 탑신(塔身)을 올린 모습이다. 기단은 흙과 돌을 섞어 낮게 바닥을 깔고, 10여 개의 길고 큰 돌을 짜서 쌓았다. 그 위의 탑신은 몸돌과 지붕돌 모두 벽돌 모양의 돌로 쌓았다. 1층 몸돌에는 불상을 모시는 방인 감실(龕室)을 두었는데, 감실 양쪽에 둔 2개의 화강암 기둥과 이맛돌의 섬세한 조각이 장식적인 효과를 더해주고 있다. 2층 이상의 몸돌은 독특하게도 중간정도의 높이마다 돌을 돌출되게 내밀어 띠를 이루고 있다. 지붕돌은 전탑의 양식에 따라 아래윗면 모두 계단 모양의 층을 이루고 있으며, 처마의 너비는 좁아져 있다. 1단 기단의 모습과 돌을 다듬은 솜씨, 감실의 장식 등으로 미루어 보아 통일신라시대에 세워진 것으로 추정된다. 전체적인 균형과 정연한 축조방식을 갖추고 있으며, 장중한 아름다움을 보여주고 있는 우수한 작품이다. 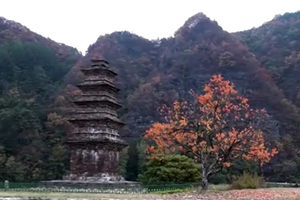 This stone pagoda stands in the center of a farmland in a small farming village called Bonggam, Yeongyang-gun, Gyeongsangbuk-do Province. A large number of fragments of roof tiles and celadon are scattered around the pagoda, suggesting that there once was a temple here. The pagoda, Bonggam Five-story Stone Pagoda, takes its name from the village in which it is located. A five-story body stands on a single-tier foundation comprising about 10 or so large rectangular stones. The platform is made of earth and gravel. The body and roof of the pagoda are made of stones cut in the shape of a brick. The first story has a niche complete with door posts and frame elaborately carved on one side. From the second story up, the middle portion of each body projects outward, forms a band-like shape. The roof of each story is stepped on both the under and upper sides as in most brick pagodas. The exact number of the steps is not available because of the thick vines winding around them. 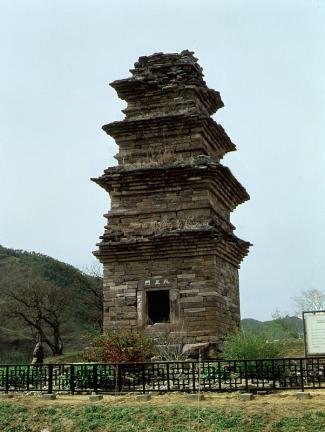 Judging from the single-tier foundation, excellent stonework, and the ornament around the niche, this pagoda seems to date from the Unified Silla period. 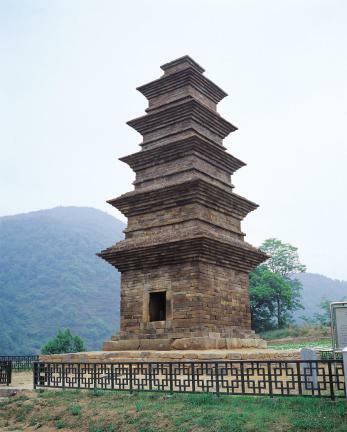 Overall proportions, well-ordered composition and magnificent beauty make this pagoda a representative example of pagodas consisting of stones cut in the shape of a brick.